"Iran is closer to getting an (atomic) bomb than is thought. Only things that could be proven were written (in the report), but in reality there are many other things that we see." The UN report has went further than any other in the past decade to confirm that Iran is indeed weaponizing its nuclear program. These are facts that the US and Israel have known for years, but have only been revealed by the UN since a change in leadership. 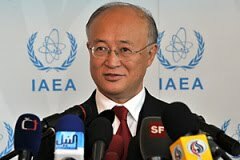 In 2009, Japan's Yukiya Amano was elected to serve as the head of the UN's International Atomic Energy Agency. He replaced Islamist Mohamed El Baradei, who was considered soft on Iran's nuclear development, often emphatically denying that Iran was developing a weapons system, despite intelligence contrary to his position. Amano won the IAEA position over another Islamist, Abdul Samad Minty from South Africa. Minty was positioned to challenge the US and other nuclear powers to disarm. Minty was supported by Arab states. The Jerusalem Post reported in July 2009 that Israel was relieved that Minty did not win the position. The Post said that Israeli officials thought Minty's relationship with Iran was too cozy. South Africa, where Minty is from, supported Iran because of historical and business relationships, which included Iran providing cheap oil. Under Minty's guidance, South Africa abstained from confirming the 2006 IAEA report on Iran, siding with Islamic nations and Iran by withholding its vote. MSNBC reported in March 2009 that "Support for Amano from the US, Canada, the European Union and others was to an extent less because he was the ideal candidate and more 'because of fears that Minty would become a second El Baradei.'" It is no coincidence that the recent report on Iranian nukes by the UN's nuclear watchdog had more of the truth in it than El Baradei would have allowed. But according to the Israeli Prime Minister, it still doesn't disclose all that Israeli intelligence knows. "Behold, Damascus is taken away from being a city, and it shall be a ruinous heap." Given the state of circumstances, the world is far closer to this prophetic fulfillment than it was before the UN report on Iran.